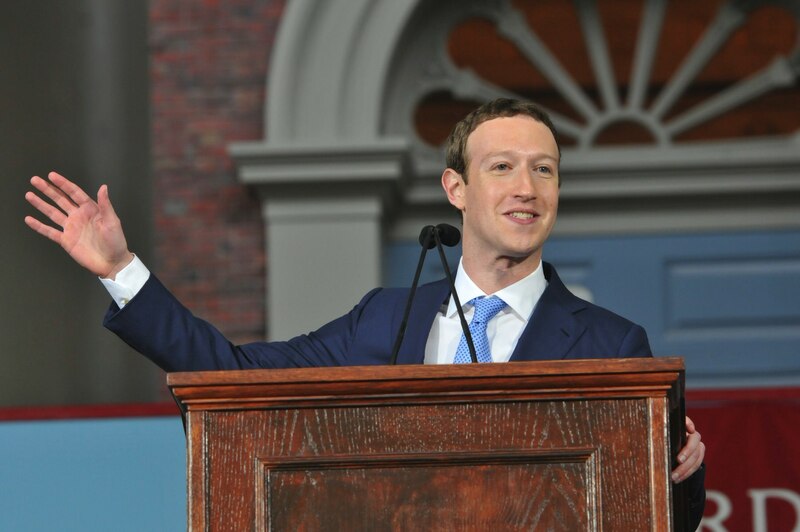 Setting a tone for the event, Facebook CEO and co-founder Mark Zuckerberg, a newly minted Doctor of Laws, had days earlier live-streamed a visit to his former Kirkland House suite. “This is literally where I sat,” he told the (virtual) audience, his phone panning to take it in. “This is where I programmed Facebook.” And it looked just the same, he declared, “minus the poster in the background [for the movie Ferris Bueller’s Day Off]. That’s not my poster.” But the House was slated for renovations. He’d never see it like this again. What did he have to say to that? But if anyone sensed an incongruity between the pomp surrounding the continuity of old traditions, and the young tech titan’s relentlessly forward-looking view, this afternoon flooded it with festive spirit and school pride. The price of our commitment to freedom of speech is paid disproportionately by these students. For them, free speech has not infrequently included enduring a questioning of their abilities, their humanity, their morality—their very legitimacy here. Our values and our theory of education rest on the assumption that members of our community will take the risk of speaking and will actively compete in our wild rumpus of argument and ideas. It requires them as well to be fearless in face of argument or challenge or even verbal insult. And it expects that fearlessness even when the challenge is directed to the very identity—race, religion, gender, ethnicity, sexual orientation, nationality—that may have made them uncertain about their right to be here in the first place. Demonstrating such fearlessness is hard; no one should be mocked as a snowflake for finding it so. Hard, but important and attainable. Free speech doesn’t just happen and require intervention when it is impeded. It is not about the freedom to outshout others while everyone has their fingers in their ears. For free speech to flourish, we must build an environment where everyone takes responsibility for the right not just to speak—but to hear and be heard, where everyone assumes the responsibility to treat others with dignity and respect. It requires not just speakers, but in the words of James Ryan, dean of our Graduate School of Education, generous listeners. Amidst the current soul searching about free speech, we need to devote more attention to establishing the conditions in which everyone’s speech is encouraged and taken seriously. Read President Faust’s full text here. Zipping ‘round a NASCAR track, dropping by a family beef farm, stopping at a Ford plant outside Detroit: Mark Zuckerberg has come to look for America. Whatever’s said by the media (or in unsealed court filings ), the Facebook co-founder and CEO has insisted that his 50-state tour isn’t just a prelude to a run for elected office. This latest leg of the trip went from Mount Katahdin and a shut-down paper mill in Millinocket, Maine, all the way down memory lane, as he and his wife, Priscilla Chan ’07, returned to old haunts in the Boston area: his favorite pizza joint; her old high school. Final destination: Harvard, for his Commencement address and honorary degree, and her tenth reunion. When our parents graduated, that sense of purpose reliably came from your job, your church, your community, but today, technology and automation are eliminating many jobs. Membership in a lot of communities has been declining, and a lot of people are feeling disconnected and depressed, and are trying to fill a void in their lives. As I've traveled around, I've sat with children in juvenile detention and opioid addicts who told me that maybe their lives would have turned out differently if they just had something to do—an after-school program, or somewhere to go. I met factory workers who know their old jobs aren't coming back, and are just trying to find their paths ahead. For our society to keep moving forward, we have a generational challenge. To not only create new jobs, but to create a renewed sense of purpose. He offered three ways that the new graduates’ generation could approach this. The first was to take on “big, meaningful projects,” and in doing so, to be unafraid of uncertainty or making mistakes. "Anyone taking on a complex problem is going to get blamed for not fully understanding it, even though it's impossible to know everything up front,” he advised the audience. “Anyone taking initiative will always get criticized for moving too fast, because there's always someone who wants to slow you down." We should have a society that measures progress not just by economic measures like GDP, but by how many of us have a role we find meaningful. We should explore ideas like universal basic income to make sure that everyone has a cushion to find new ideas. We’re all going to change jobs and roles every time, so we need affordable childcare to get to work, and healthcare that's not tied to just one employer. And we’re all going to make mistakes, so we need a society that’s less focused on locking us up and stigmatizing us when we do. And as our technology keeps on evolving, we need a society that is more focused on providing continuous education through our lives. Here is a young guy who has every reason to be cynical. He wasn’t sure if the country he calls home, the only one he’s known, was going to deny him his dream of going to college. But he wasn’t feeling sorry for himself. He wasn’t even thinking of himself. He has a greater sense of purpose, and he is going to bring people along with him. It says something about our situation today that I can’t even say his name, because I don’t want to put him at risk. But if a high-school senior who doesn’t know what the future holds for him can do his part to move the world forward, then we owe it to the world to do our part, too. Read Mark Zuckerberg’s full text  here. Afternoon exercises are officially the annual meeting of the Harvard Alumni Association (HAA). Before the two main addresses, HAA president Marty Grasso ’78 announced his successor, Susan Morris Novick ’85, as well as the results of the elections  for the HAA board of directors and Harvard’s Board of Overseers. 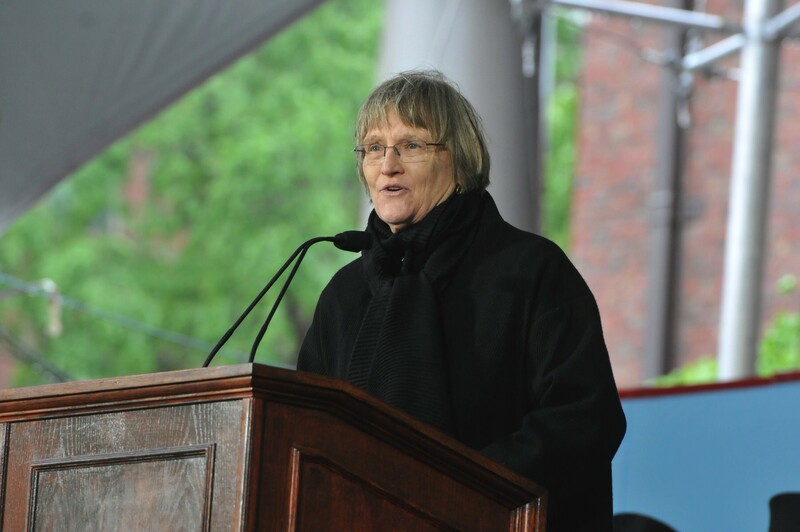 President Drew Faust also presented three Harvard Medals , which honor extraordinary service to the University, to longtime HAA volunteer and Crimson athletic memorabilia curator Warren Masters “Renny” Little ’55; former adviser to multiple Harvard presidents A. Clayton Spencer, A.M. ’82; and architect Henry N. Cobb ’47, M.Arch. ’49, a former professor and department chair at the Graduate School of Design.